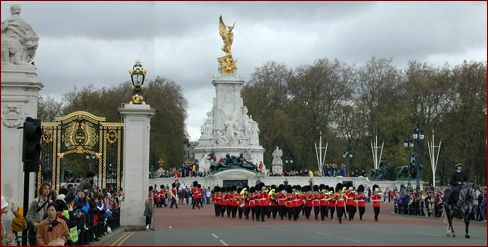 As we approach Buckingham Palace we notice a steady stream of well-dressed people heading away from it. Uncommonly well-dressed. I ask and am told that it's the Prince's Tea, an award ceremony for Britons who show remarkable contributions to the realm (or somesuch). I see lots of men wearing local variants of what looks like Boy Scout uniforms. An interesting bunch. We've never made a point of braving the crowds to watch the changing of the guards, but today we're close enough to watch the Grenadier Guards marching by on their way to their barracks. 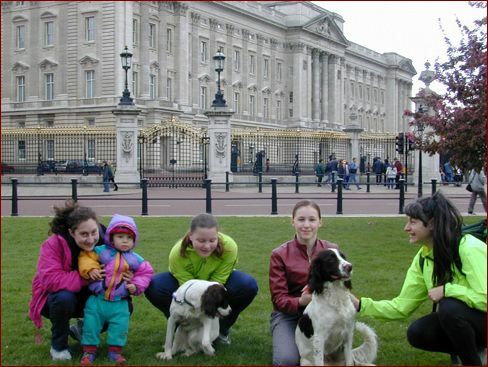 Back at Buckingham Palace Isaac found dogs. The two girls who own these cocker spaniels deal very well with an exuberant litle boy. Everyone poses. Next we happen to wind up behind the security lines yet again, this time to rub shoulders with the Lord Mayor of the City of London.